Today we bid farewell to our Ganpati and Gauri. It is always a bittersweet moment, letting go of our favourites with a prayer thanking them for blessing us every year, apologising for any mistakes we may have made and asking them to come back again real soon. Initially we used to go to the beach for immersion but a couple of years back they started an artificial pond close to home and every year since we have been immersing our idol in the pond. 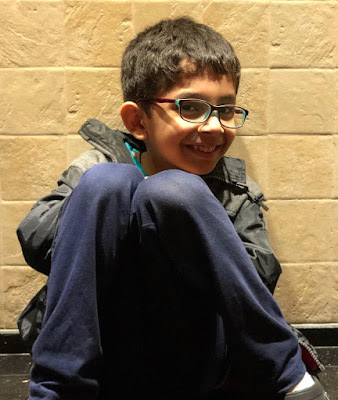 Until last year Ronav would cry to see Ganpati go and couldn't understand the concept and Samaya was too little to really understand anything at all. This year Ronav did't cry but Samaya did to see her Ganpati go. It was Ronav explaining to her that Ganpati needed to go see his mama and will be back again soon. Its amazing to see how just a year can make such a difference in a child's maturity level. One of our very favourite traditions is even more dear to us now that the kids participate in it so beautifully. This is a part of MY #100happydays challenge - a way to remind myself to pause and find happiness in the little things in life and to live in the moment. To be grateful for all that I have, every single day. Hopefully you will join me in this journey of self discovery and find your own happiness along the way. 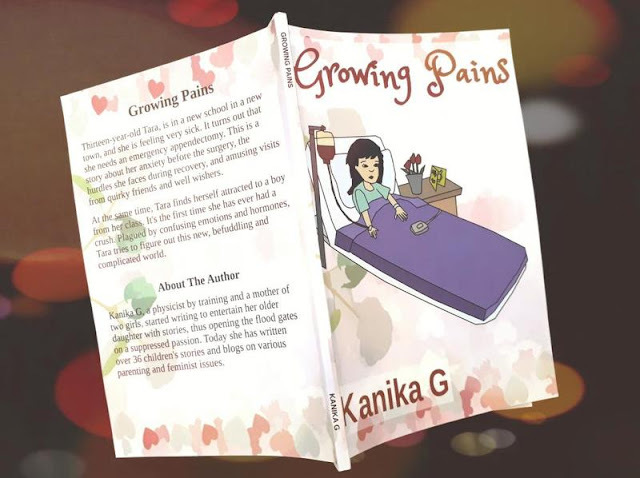 Categorised as a young adult book, Growing Pains by Kanika G is a book that will enthral teenagers and adults alike. I picked up this book because I love the author's writing style. I have been following her blog for sometime now and I love the simple and scientific feel of all her articles. Growing Pains is her debut novella, about thirteen year old Tara, who finds herself in a medical emergency at her new school and needs immediate surgery for appendicitis. What follows are the emotions of a typical teenager battling raging hormones preparing herself for surgery and her quirky friends and family. August is a very special month. Every major life altering event for me has happened in August. I started dental school in August, my then boyfriend and current husband moved back from the US in August, all my 3 babies are August born! It’s raining birthdays in August. This time it’s extra special as my first baby - my clinic Bright Whites completes 10 years today. A big shout out and a humble heartfelt thank you to everyone who made it possible for me. My amazing family who stood by me like a rock so I could fulfill my dream, my generous friends who trusted me enough to come to the clinic for their treatment and also referred patients, my ever so helpful and supportive staff and most of all my patients. I have been very fortunate by the grace of the Almighty to have survived comfortably in this cut throat competition without any forms of advertising all these years. All thanks to my patients who have been kind enough to send referrals and help us grow bit by bit. In a blink of an eye you are 6 today. I can still feel the excitement of being wheeled into the operation theatre knowing I would get to hold you in my arms after 9 long months and that our lives were about to change forever. The digital SLR to capture your first picture, the digital clock to get the exact birth time down to the second, music playing in the background....we planned for it all. I always knew that I wanted to be a mum someday, and the best one just like my mum, but I wasn't in a rush. I wanted a lot of things before that, which by God's grace I got - a challenging profession, a loving husband and a beautiful home and family. And then it wasn't long before you came along.